At Home With The Hansens: Worth Trying? Have you heard about Sketchers Tone Ups? I hadn't, until recently anyway. And all of a sudden I am hearing about them everywhere! First my Mom was searching for them, then a cashier at Whole Foods mentioned them and last week after yoga several ladies were talking about them. One of them actually had a pair on and said they were the most comfortable flip flops she's ever worn and would probably never be able to wear anything else. Sounds pretty promising to me! So now, not only is my interest peaked, but I am dying to buy a pair to see what all the hype is about. So what's so special about the Tone Ups? 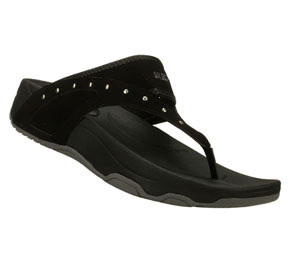 According to the manufacturer, they are a fitness sandal that will shape you up while you walk, improve your posture, tighten up muscles, and reduce cellulite. While I am not promoting getting your exercise from wearing sandals, I definitely think they are worth trying, both for the comfort and said improvement in posture. I'm really loving these. They're cute, sensible and would be perfect to and from yoga! i've been looking into these too! i also read about the sketchers tone up sneakers and the reebok easy tone shoes! Okay, now you've got me looking at the Reebok Toneups and I love the tennis shoes. Much more attractive than the Sketchers tennies, which I definitely didn't like!